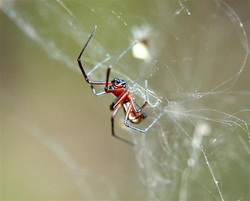 The Bowl and Doily Weaver Spider is a very small spider, typically brown in color. They like to build webs in shrubs, like boxwood bushes or holly trees. The Bowl and Doily Spier is named for the web it creates, which has two parts: a bowl-shaped web and a flat (doily) web, which the spider lives between. These spiders are rarely seen indoors. To find information about the Goldenrod Crab Spider, click here!